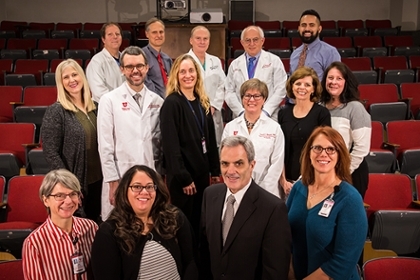 University of Utah Health is one of three sites in the nation to conduct a seven-year, multiple-million dollar, multi-disciplinary contract with the National Institute of Health. U of U Health investigators are partnering with the Eunice Kennedy Shriver National Institutes of Child Health and Human Development (NICHD) internal group for a series of studies focusing on improving population health throughout the life-course surrounding fertility, pregnancy and the fetal origins of adult disease. The NICHD established the Division of Intramural Population Health Research (DIPHR) to improve population health from birth to death by maximizing health and preventing disease. Research has focused on various population subgroups, with an emphasis on early origins of health and disease. A significant proportion of the focus is on fertility, pregnancy and childhood development. There is an emphasis on at-risk populations including racial-ethnic minorities, individuals with obesity, disabilities or chronic diseases, and poverty. The project will involve a series of studies aimed at issues relevant to reproductive and childhood health. The first study, led by C. Matthew Peterson, M.D., professor of obstetrics/gynecology, will assess if infertility is a general marker of health, and if there are subtle underlying health issues or environmental issues that increase a woman’s inability to become pregnant or carry a child to term. Past studies have shown that women with inflammation have problems becoming pregnant. The study will assess whether treatments for inflammation can improve fertility. 1,800 women nationwide (600 in Utah) will be divided into three study cohorts: women taking a low dose aspirin and a statin, women taking aspirin alone, (both of which reduce inflammation) and a placebo group. Fertility rates and pregnancy outcomes will be measured. The second study, led by obstetrics/gynecology professor Robert Silver, M.D., will start in about a year and will evaluate the effects of maternal and paternal mental health on pregnancy outcomes and childhood development. The Utah center consists of the Utah Center for Reproductive Medicine as well as the five referral hospitals: University of Utah Health, Intermountain Medical Center, LDS Hospital, McKayDee Hospital Center, Utah Valley Regional Medical Center. Within U of U Health, multiple departments are collaborating including urology, pediatrics, hospital operations, perinatal epidemiology, psychiatry, population health sciences, family medicine and dentistry. Two attributes that makes this network stand out is that together these hospitals care for the majority of fertility and high-risk perinatal referrals in the region, and they have extensive experience in fertility enhancement, preconception counseling, pregnancy, and post pregnancy outcome management and follow-up. Middle Row Left To Right: Kathy Harvey OGRN, Joe Letourneau MD OBGYN: REI, Megan Link MD OBGYN: REI,Sarah Berga MD OBGYN :REI, Laurie Lesher RN – Peds, Denise Lamb RN OGRN.